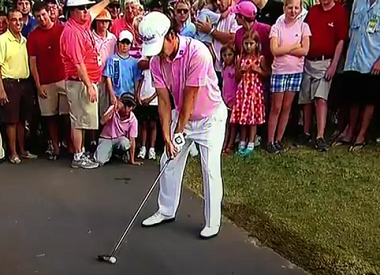 I have not seen the TV coverage of the final round of the Player's Championship in TPC Sawgrass last Sunday, but I have received several enquiries asking why Kevin Na was permitted to play his ball from off the road on the 18th hole after taking relief. It was suggested that this was a breach of the Rules as he had not taken complete relief, as required by Rule 24-1b (see this blog on taking complete relief). Once again the TV commentators seem to have caused some of this confusion by speculating that he was given the option of taking relief because a curb at the side of the path interfered with his stance. In fact, this was not the case. The walking Rules Official had informed Na that he was entitled to take free relief because his ball was lying in an abnormal ground condition close to the path, apparently caused by recent crowd damage. He then proceeded according to the Rules, which was to determine the nearest point of relief where there was no interference from the abnormal ground condition and was not nearer the hole, and drop his ball within one club-length of this point, which happened to be on the asphalt path. Na dropped his ball on the path and it came to rest in a position where it did not have to be re-dropped. Because the asphalt path is an immovable obstruction he could then have taken free relief again by determining the nearest point of relief from it, not nearer the hole, and dropping a ball within one club-length of that point. However, he obviously decided that the lie that he had after placing his ball on the road was likely to be better than dropping the ball on the trampled grass at the side of the road. It is not mandatory for players to take relief from immovable obstructions (Rule 24-2b) and he chose not to do so. Hindsight suggests that he made the right decision as he was able to play a great shot onto the green and made his par with two putts. I hope that you noticed that I wrote this whole piece about Kevin Na without mentioning his multiple waggles. Duh!! If you are interested in the Rules of Golf then I think that you will find my ‘Rhodes Rules School’ photo series interesting. You can receive them one at a time each week by email for 99 weeks, or you can purchase the whole set for $9, €7 or £6. Click here for a specimen copy and here to purchase.